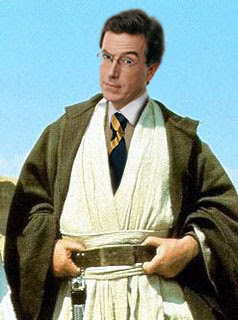 Marty Simpson: The Arm-Chair Place-Kicker (And Comedian): Help me, Mr. Stephen Colbert.You're my only hope. 27 Response to 'Help me, Mr. Stephen Colbert. Hi Marty!! (Stephen Cobert, we hope you're listening!!) Great job on the goldendoodles!! They're cute! Mr. Colbert, if you do read these, I am completely sorry that the Anonymous fan above left the L out of your name. In some countries that is a show of admiration. I believe a little part of the love I have for Stephen Colbert will wither and die if he chooses to completely ignore this. I desperately hope this does not happen. Please help me love you to the fullest Mr. Colbert! P.S. The word verification for me to submit my message was "parvo." It's funny because it's appropriate! You have to be kidding? That's awesome. For those that don't know, my dog, Luke got the Parvo virus and almost died! Please don't lose faith in Mr. Colbert if he chooses to ignore this. It is a free-market, he can choose to do whatever he wants. He is, of course, one of those select folks that the new Obama tax plan will hit hard, so we should keep good thoughts for Mr. Colbert. Sir, it would be an injustice to Mr. Simpson if he were denied his Stamp of Truthiness (not the Bump)...he has had to endure co-existence with this dog breed as chronicled in his comedic expose and it would be a shame that the Obama family would be denied their experience with this lovely breed. I mean, Barack's mother in law will be living in the Lincoln Bedroom; she would be perfect to follow their "Doodle-dog" around the white house cleaning up its messes. my love for all things colbert is unconditional, so i'll not waste time w/ idle threats...i merely beseech his excellency to look shallow into his heart and find the courage to do the right thing...'cause it's the right thing to do. if not, i'll be forced to skip the idle threats and proceed to idol threats (sir, i know where your preferred pomade is manufactured and i can disrupt the supply line for a period of no less than six months should you ignore our hardly audible minority). the goldendoodle.... that is the dog of the future. Marty, you hit that one out of the park. The GoldenDoodle...I gotta have one! GodlenDoodle is the dog for me!! Where can i get one! That fountain sounds like a great feature! Only you, Marty, could find fame with something as ridiculous sounding as a Goldendoodle -- sounds like the villain in a canine spy thriller starring a suave Lab named Bone, James Bone. Wow -- I guess you're right -- your jokes about Goldendoodles are the funniest! This is fantastic. Now I finally know what a Golden Doodle is. Although I asked someone on the street earlier today, and they responded, "Twenty Bucks... same as in the city." "Honey, you've been so sweet lately, I was just thinking it was time for a doodle." Unfortunately, they weren't 20 dollars! Fact is, word on the street is gonna spread about Goldendoodles...wouldn't Mr. Colbert wanna have a piece o' the Doodle? Now is the time for real CHANGE! Forget your "run of the mill" dogs, the Goldendoodle is the only choice! Marty, you are worthy to receive the Stamp of Truthiness with a notation for Funniness. Great Stuff! Help this guy Mr. Colbert. Please!!!!! this is the most bitter failure at any attempt at humor i have ever seen. much less on a stage. bravo for suckiness. Regarding the comment made Dated: November 28, 2008 10:39 p.m. Posting under a code name of "Anonymous" is not like you Mr. Colbert. I assumed if you didn't find my writings entertaining, you would have at least had the common decency to write me a personal email. However, any first hand correspondence I receive from Your Excellency, good or bad, I choose to treat as golden (like the doodle.) So, THANK YOU MR. COLBERT!! Again, I say, "Help me, Mr. Stephen Colbert. You are my only hope." I've often heard Ned Flanders say, "I think Marty's comedy is doo-doo doodly awesome!" Marty, you know you're a Stallion when the horseflies won't leave you alone.